This page has gone through a lot of changes over the years. so that this can be my job. I have never served ads on this site. but I always try to give you something for your money. I’m stuck writing power tool product descriptions instead, just to make rent. That’s not the kind of garbage I want to be filling the internet with. THIS is the kind of garbage I want to be filling the internet with. By supporting my Patreon, you will free me up to spend more time writing and researching myths. and the ability to vote on your favorite mythoses for me to tell. that’s how desperate I am. and that you give me money right now because I’m hungry. I would like to donate for a particular myth or two, but for various super-obnoxious reasons, I refuse categorically to use PayPal. Is there a PO box I could send a check/money order too, or a street address? I am a respectful, violence-opposing, idealistic type of person, not someone who would ever use your personal information in any negative way, nor release it to anyone else. Plus I have a 17 year old son, a full time job, and a chronic pain/weakness-themed illness, so I wouldn’t have time or to get up to anything hokey even if I wanted to. And I’d prefer the myth(s) in text form instead of video. There are complicated reasons for that, so what type of donation would I be looking at? I’m down with that. I’ll donate $60 for a text version of the Odyssey. I’ll send you ten bucks to do a text entry of “On the Origin of the World” from the Nag Hammadi scriptures. I don’t think you’ll be disappointed. Are you down? I really think there needs to be a shirt to wear for those of us who are through dealing with drama-messes. A shirt that solves these complicated issues with the wisdom of Zeus. Speaking of the unspeakable things you’re willing to do for money, why can’t we have that icon guy on a t-shirt or rather how much would it cost to put that icon guy on a t-shirt because spoiler alert I would totally buy one. Right now. As I’m typing. If I only had the option. 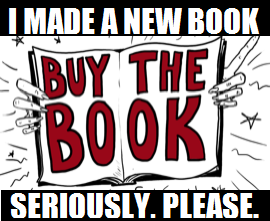 BRB buying 10 books. Payday from work have never been so sweet. By the way, does it matters from where do I buy the book? You can buy it from anywhere, but i prefer you buy it new. I bought your book as an e-book like 2 or 3 days ago or something! DOESN’T COUNT. BUY ANOTHER ONE. Can I just send my selfie with your book instead of the receipt?????? I purposefully removed the donate button so that kind souls such as yourself would be moved to buy my book! Doooo itttttt. Come on. Nope. You are the one trying to get the money, so do it my way or not at all. Your heartfelt plea has moved me, or something. Done. Both me and my mom bought your book! She got the Kindle version, I got the print version from Amazon after seeing a screen shot of the chapters on Tumblr. Amaze-balls! My stars! The Patreon page itself is a place of sunshine and warmth even to those with no money to donate. What a pleasant surprise! May it endure.